This is my first article here at Solodallas.com. I hope this can be useful to all of you who are interested in buying old Marshall amps. Before starting, I must warn you that acquiring vintage gear can be really risky. You can end up buying something that is not what you expected or even something that is damaged or modded beyond repair. So, always keep your eyes open for “fishy” deals, look for information, and always ask for high definition photos (especially from the interior of the amps – the circuit, the tubes and transformers) to make sure everything is right. If you don’t have much experience (myself included, to be honest :P), I recommend asking help from the members here of the community. Post a link of the desired amp on the “Ebay Watch Post”, so we can help analyzing it. 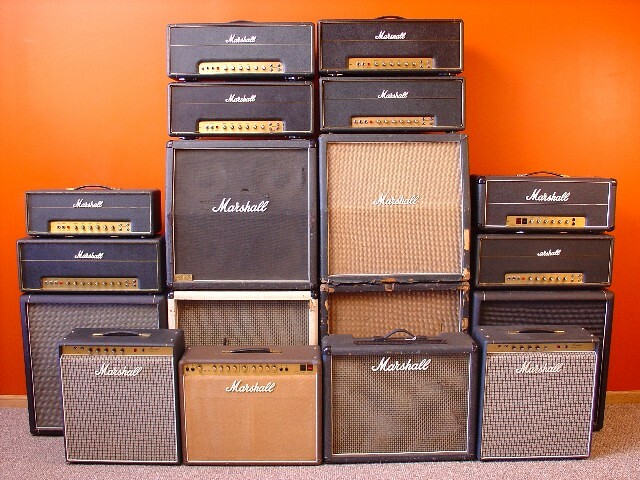 In this article, I’ll try to cover the more “desirable” Marshall amps that were built since 1962 up to the JCM800 series, wich most consider to be the “last” great Marshalls produced (That until Marshall released the Vintage Modern series. These amps are really great!). I’ll concentrate on “how they sound”, “how they look like” and also “how to tell them apart”. I will also try to give examples of where they were used..
One of the most confusing things concerning these vintage amps are the model numbers. I’ll write down the most important ones and what they mean. 2245 – Although I believe the first JTM-45s didn’t really have a model number, this is the code that is related to them on Marshall’s website. These are just a few of the thousands of codes that Marshall came up with for their amps. I won’t write the rest because it may confuse you even more. So, let’s stick to those for a while. It’s important to note that, for example, a 1959 amp has nothing to do with the year 1959. Why they chose those numbers then? I don’t know. The addition of a T at the end of the code refers to a Tremolo amp. The addition of a S at the end of the code refers to a smaller version of the head, made to fit with a 4X10 cab – This only aplies to the 2204S head from the JCM series. Combo versions of the amps always had a special code attributed to them (for example, the combo version of the JMP 2204 was the 2104). The 1959S and the 1987S are the codes for the first “Plexi” reissues, made in 1988. 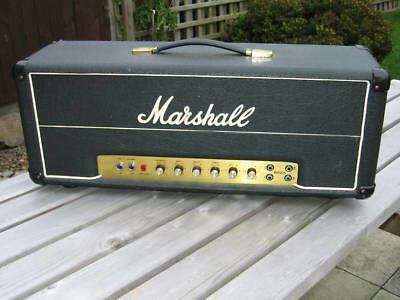 The first Marshall ever made. It was basically a copy of the 1959 Fender Bassman. It had ECC83 (a.k.a. 12ax7) pre-amp tubes and a GZ34 rectifier tube. The first amps had 5881 power tubes. They were changed to KT66 shortly after. It was made as a head and as a combo (known as the “Bluesbreaker” combo). There were many cosmetic changes on the first years until it finally got the “Classic Marshall Look” by 1964. The front panel has “Presence”, “Bass”, “Middle” and “Treble” controls, as well as 2 volumes and 4 inputs. In 1965, the plexiglass faceplates were introduced. This is the reason why Marshalls of this early era (up to 1968) are known as “Plexis”. The sound of this amplifier is “creamy” and “warm”. I would say “crispy” too. This amp is more suited for blues players, with a smoother sound. Eric Clapton used a JTM-45 combo on the legendary Blues Breakers with Eric Clapton “Beano” album (Now you know why this amp was called “Bluesbreaker” :P) He used his Les Paul through the Normal Channel of the amp. He discovered that, by playing really loud, it would start to “break up”. It was something really new. It changed music forever. The then “horrible” distorted and saturated sound turned into what we know today as the “rock tone” (maybe not yet… But we will get there). Another example of this amp can be heard on AC/DC’s Ballbreaker album. Free’s debut album Tons of Sobs was probably recorded with a JTM-45 too. This is a confusing era, with lots of changes and new models. So, I’ll try to explain it the best I can. 😛 The transitition from the JTM to the JMP amps happened, in my view, with three steps. The first one was the creation of the first 100w amp. Pete Townshend and John Entwistle of The Who needed amps that could overpower the noisy and energetic crowds. 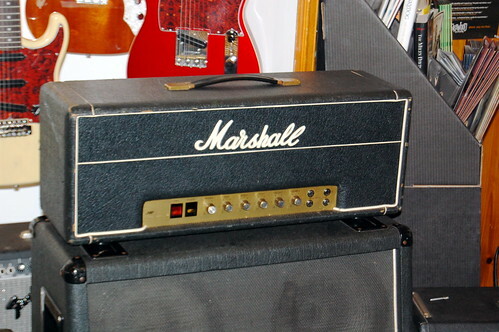 Marshall then “hot-rodded” the JTM-45 using four KT66 and two 50w output transformers to handle the extra wattage. A larger headbox was also used. The result was the JTM-45/100 (JTM-100, for short). With more power tubes, the amp had more headroom, a tighter bass response and more definition. It was the first Marshall with a solid state rectifier. Another player that acquired some of those was Eric Clapton, who used them to tour with Cream. The change to EL-34 tubes resulted in the increase of power. The name of the amps was also changed. This is when the confusing model numbers started being used I believe. 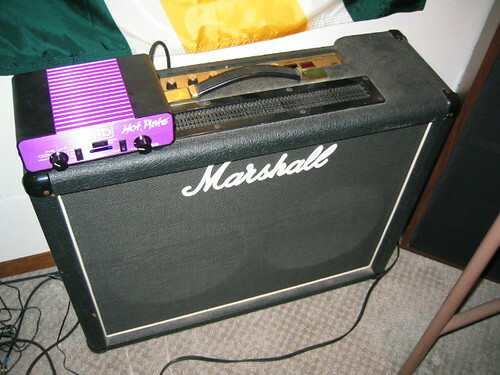 The JTM-45 was now called Marshall Lead 50w #1987. This amp had a more edgy sound than the JTM-45, due to the EL-34s. But it also had the characteristic smoothness of the tube rectifier. For this reason, this amp is known today as the JTM-50. I’m not sure what recordings this amp was responsible for. 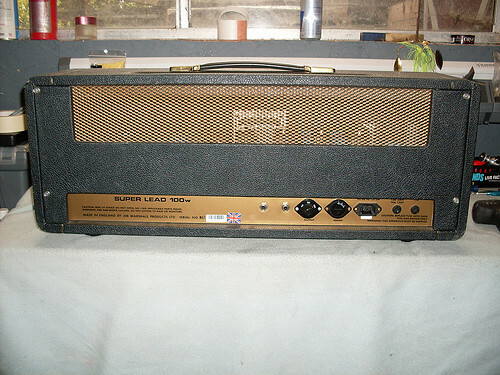 But Fil’s Metro is a reproduction of this very same amp, so you might be familiar with it by now. Please note the “Black Flag” JTM marking that was used at that time. The JTM-100, now with four EL-34s too, also gained a proper 100w transformer. The name? It was called Marshall Super Lead 100w #1959 (Although they still didn’t have the “JMP” mark on the front, In my view, this amps are already into the JMP territory, because they have all of the JMP characteristics). By late 1966 – early 1967, Marshall stopped using the GZ34 tube rectifier in all the models and started using a solid state rectifier instead. The JTM50 now definetly turned into the JMP incarnation of the 1987 model, although the “formal” name ramained the same. This amp is basically the 50w version of the Super Lead, so the sound is really similar to it’s “big brother”. It used the same headbox as the Super Lead. Front panel was also identical. The Marshall Super PA 50w #1963 and the Marshall Super PA 100w #1968 amps may scare you a bit when you look at them. These amps had two “sections” (The most common thing to do was to set one section to Lead specs and the other one to Bass specs). With a standard eq (presence, bass, middle, treble), a total of 8 inputs (4 for each “section”) and 4 volumes, this thing is a real Frankstein monster. This is a really underrated amp. It is just as good as the other (probably even more versatile), but the “weird looks” probably scare people a bit and they think this is not a good amp. For that reason, these amps are less expensive and are a really great deal (if in good condition, of course). The back of a Marshall Major. Note the 4 KT88 tubes. The extra knob probably is a Master Volume mod. 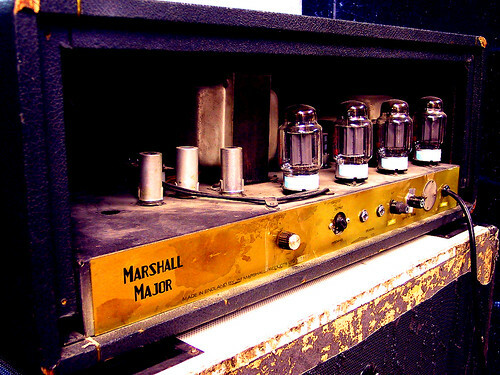 The Marshall Major 200w has a different circuit than its “little brothers”: the pre-amp has two ECC83s, but the third tube (the “driver tube”) is an ECC82 (a.k.a. 12au7). The power section has four KT88 tubes. These amps were not only stupidly loud, but also really really clean. Ritchie Blackmore was a famous user of the Major, but they were heavily modded at the Marshall factory (as said in an interview) and later by a man called John Dawk. Blackmore’s amps had extra power tubes, making it even more powerful, as well as extra gain stages. Don’t ask how that’s even possible. I have no clue either. This is one of the reasons why the Major was discontinued in 1974. These amps had an extra 12ax7 tube for the “tremolo” effect. They are easy to tell apart because the two extra knobs (“speed” and “intensity”) on the front panel. These amps weren’t much popular and were discontinued in 1973. And now, we are oficially into the JMP era. 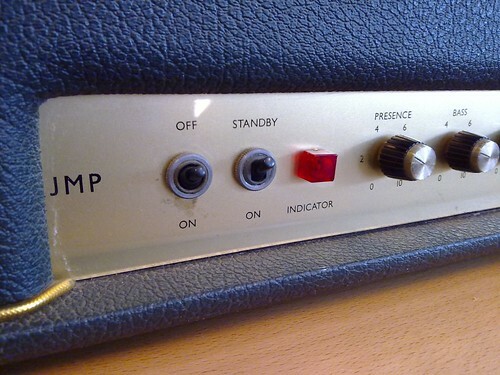 The first JMP marked amps came out around late 1967, although, as you saw, all of them already had JMP characteristics. So, it was more of a “brand” renewal. An important note is that, by 1968, there were some changes on the circuits that made the amps more aggressive. All the models mentioned above are still being produced here. The amplifiers that were shipped to America had an extra toggle, wich was the polarity switch. That happened until around 1976. A notable user of these amps is a guy named Eddie. 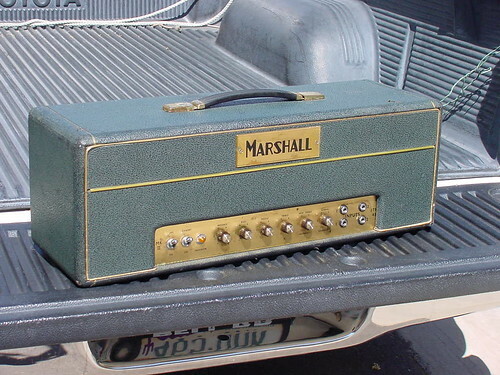 Yes: On Van Halen’s debut album, a 100% stock 1968 Marshall Super Lead #1959 was used. With a thing called variac, he was able to kind of “attenuate” the amp and obtain more gain. Malcolm Young said his favourite amp is an old Super Bass amp, probably from this period too (it could be an early Metal-Face as well). In mid-1969, the plexiglass faceplates were replaced by brushed aluminium faceplates, hence the nickname “Metal-faces”. This change didn’t affect the tone directly. What happened is that there were more changes in the components and the amps became even more aggressive: they were brighter and had a more drive than before. This was actually good for most guitar players, since they wanted more and more gain. Another good side here is that amps made after 1970 doesn’t have so much collectible value as the early “Plexi” amps. These are probably the best oportunities to own a “Plexi style” circuit without spending a fortune (with some tweaks, they can be converted into the “smoother” late 60’s circuit). It’s important to note that from 1972 onwards, Marshall amps that were shipped to America had 6550 power tubes, because american dealers said EL-34s were breaking too much often inside the warranty time. There weren’t much changes afterwards. The only one that worth mentioning is the switch to PCB style assembly on late-1973. Did it affect the tone? I can’t really tell. It got worse? Definetly not. They are as reliable as the PTP Marshalls. You can read more about this here. Another change (wich is not that important) is that now the 50w chassis were put in the same bigger style headbox as the 100w. So, the only way to tell them apart (besides the model written on the back, and the number of power tubes) is by looking at the top. If it has a top vent, then it’s a 100w. If it doesn’t, it’s a 50w. AC/DC probably used Metal-Faces from this era to record High Voltage, TNT and Dirty Deeds Done Dirt Cheap, as well as live performances up to 1976 (Angus used to play his solos with the neck pickup a lot back then, probably because he coudn’t always play with his amps loud enough to get the desired overdrive). 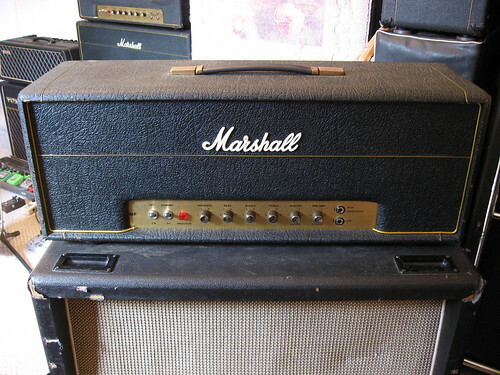 The PA and Super PA heads were discontinued around 1975. UPDATE: It seems that the early versions of the 2203 (100w – with the old cosmetics) already had the cascaded pre-amp. Only the 2204 (50w) suffered from the lack of gain at low volumes. 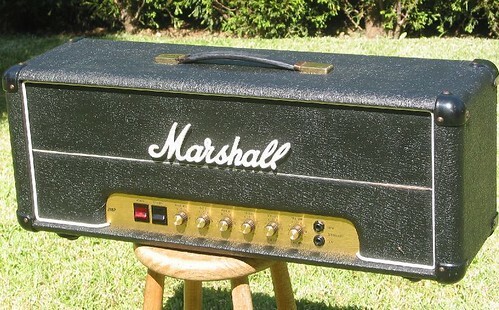 Around this time, Marshall decided to upgrade the cosmetics of their amps. They started using rocker style switches instead of the old toggle switches (yes. This is why I called it “Rocker Switch Era”. No pun intended), the “Marshall” logo was bigger and there was a thicker white binding on the corners, as well as under the logo. The only thing is: there were many parts left on stock and they had to use them! So, if you find a weird looking 1976 – 1977 JMP, it’s probably just because they were using some old parts to assemble them. By mid-1977, they were over and only new parts were used. Interestingly, the amps for the Canadian market kept the EL-34 tubes and the old toggle switches. [Warning: lame joke coming up!] Well… The heads at Marshall worked with the volume on 11 to find a solution. After many blown tubes, they decided to try something really different this time: to cascade the pre-amp to get extra pre-amp saturation. And on late-1976 or early-1977 the magic happened… It was an instant success! You had a great overdriven tones at any volume (Of course, the louder it was, the better it would sound). It could also work as a “Plexi-style circuit”, by keeping the Master on 10 and working with the pre-amp volume. Of course, it also had a unique and distinctive voice. A way to find out if a 2204 have the cascaded pre-amp or not is the Two Cables test. Just get two cables and plug them into both inputs of the amp. Turn it on and put your hand on the other end of the cables to produce sound. Theorically, if you get sound only from one input, this means you have the cascaded circuit. If you get sound from both, you have a non-cascaded circuit. In 1976, AC/DC launched the international version of the High Voltage album, wich actually was a mix of songs from the Australian High Voltage and TNT. Marshall realized the potential of the new band and decided to sponsor them. When they got into the studio to record the Let There be Rock album, they already had brand new JMP “rocker switch” amps. So… what they used? MV or non-MV? The nasal and overdriven tone is unmistakable. They used the 2203/ 2204 Master Model heads extensively through the years. But also, they still were faithful to the old non-MV circuits So, they almost always mixed them on stage. Powerage, Highway to Hell, Back in Black… up to the Blow Up Your Video… all recorded with amps from this era. It’s hard to tell when they used what amp, but you can’t go wrong with these beasts. 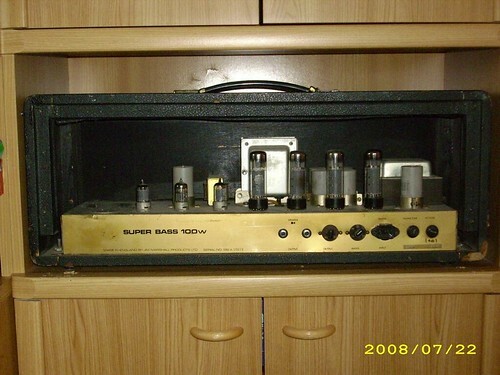 1959/ 1987/ 1992/ 1986 (non-MV): 4 inputs, 2 Volumes, Model of the amp written in block letters at the back. 2203/ 2204 (MV): 2 inputs, Pre-amp and Master Volume, Model of the amp in handwriting letter style at the back. Anything different from that (3 inputs, extra knobs, etc) is a modded amp. The two extra jacks that appear on this head are actually STOCK! “I started looking around right after I posted this (a little chat on the comments of this page regarding this same subject) and I believe I found the answer to confirm my thoughts. Here is a link to a Marshall forum page. So, this means the U.S. export versions had 6550 tubes AND the two extra output jacks. All of them are useable. The combo versions of these amps are really interesting too. So keep your eyes open for those as well. Around mid-1979 there was another minor circuit change. The result was, as you expected, more agressive amps. Also, the serial numbers started to be printed on the front panel, close to the switches. In 1980 , Marshall started using a bigger logo. At this point, Marshall’s exclusive distribution contract with Rose Morris was expiring. Free from the contract, Marshall decided to, again, renew the whole Marshall line. 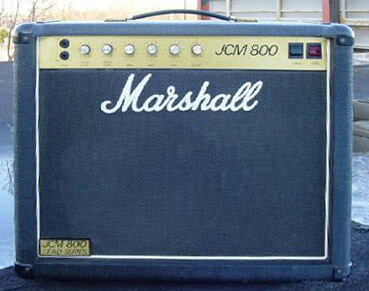 In 1981, Marshall launched the JCM800 series. It was mostly a cosmetic change. But some claim that there were, again, small changes in the circuit. making these slightly more “modern” sounding amps. The “simple circuit” JCM800s are, in my view, still quite interesting amps. Let’s take a look at what we still have here. 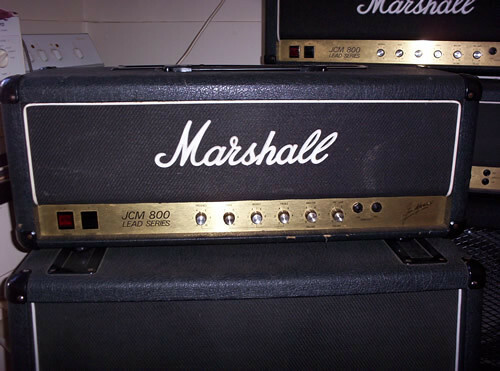 A note here is that the name “JCM800″ itself is, many times, related just to the 2203/ 2204 models, but the JCM800 was a series. This means there were other models. Altough rarer, the non-Master Volume amps (#1959/#1987/ #1992/ #1986) were still being made under the JCM name. Some amps with JMP style will surface there and there during the 80’s too. But they are basically a JCM800 in the old headbox. Combo versions, are, again, really interesting. Try to look for the ones with the same circuits as the heads mentioned above. Well… Here we got to the end of the line. There were no new interesting “simple circuit” amps launched during this period. A last important note: Avoid the JCM800 2203 and 2204 amps with “horizontal inputs” (made after 1986). The different position of the inputs meant a change in the circuit. This one was not a pleasant change and the result was a much more grainy and thin-sounding tone as they were turned up. 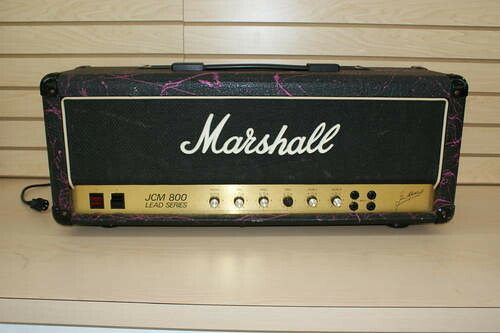 In 1989, the JCM800 line was over, and the high gain JCM900 era begun. 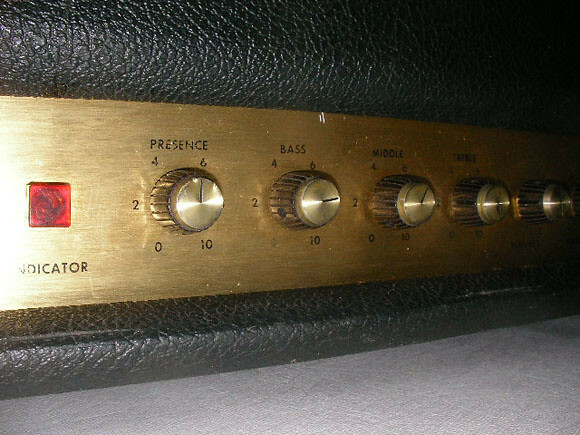 Prior to 1969, the amps don’t have serial numbers. Just got myself a JMP 2104 from early 80’s. Its got a Greenback and a Vintage 30 in the chest. The tubes are in good shape. Compared to my DSL40c the 2104 sounds extremly “thinn” without any bottom end at all. Altough I dial the Bass to 10 it still lacks huge amounts of bass to my ears.